Surabaya mt bromo kalibaru sukamade ijen bali tour that’s contain with amazing destination in east java Indonesia. Upon arrival at Surabaya airport, will pick up and meeting service with our staff then direct transfer to mt.Bromo area for about 3,5 hours. Then check in to hotel for stay overnight. Early morning around 03.00 AM we will start Mt. Bromo tour by a jeep to the view point to enjoy bromo sunrise from penanjakan mountain (2770 masl). Afterward we will continue to crossing the sea of sand, slopes and climbing up more than 200 steps to reach the rim of mount bromo crater. Back to our hotel after that for having breakfast, after check out we will continue for 5 hours drive to kalibaru area for stay overnight. At this area you can visit small plantation of coffee, cacao and tropical spices. Breakfast, and We will transfer to Sukamade by jeep 4×4. Along the way, you may see endless plantation of coffee, cacao, and traditional rubber tapping. We will visit a local village to see palm sugar process in traditional way and also stop for fisherman village at Rejegwesi beach. Trip we be continue by entering Meru betiri national park for Stay overnight at simple Sukamade Guesthouse. 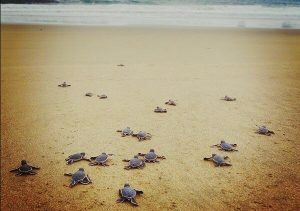 After simple dinner at the guesthouse, proceed to the Sukamade beach for the turtle excursion (sightings are not guaranteed). See the turtles slowly walk up ashore to lay their eggs. Then back to the guesthouse for overnight. breakfast and we will continue to ketapang for stay overnight, you will be at the hotel at afternoon. Early in the morning around 05.00 AM, we will drive to Paltuding area(start trekking point). Along the way you will be serve by a rain forrest and coffee plantation view. After that you take a 3 km trek to the crater.This volcano offers a savannah landscape, ruggedly beautiful panoramas, grand hiking, and a placid, brightly yellow crater-lake. The summit of Mt. Ijen is a gorgeous crater filled with haunting turquoise-blue lake with its surface streaked in the wind blow patterns of yellow sulfur vapor. By the crater lake edge, there is an evil-smelling sulfur where local people digging and carrying 70-80 kg on their bare shoulders for 3 km ascending and descending steep Mt. Ijen wall. Diposkan dalam Surabaya mt bromo kalibaru sukamade ijen dan dilabeli kalibaru, sukamade beach, Surabaya mt bromo kalibaru sukamade ijen. Markahi permalink.